Phonographic Copyright (p) – Turner Entertainment Co. Copyright (c) – Turner Entertainment Co. Published By – EMI Robbins Catalog Inc. Published By – EMI Feist Catalog, Inc. Published By – G. Schirmer Inc. Published By – CAM CINE TV MUSIC, Inc.
MADAME BOVARY. Total Time: 98:57. Tracks 1-3, 1-5 to 1-7, 1-9, 1-11, 1-13, 1-14, 1-16, 1-18, 1-19, 1-20, 1-22, 1-23, 1-25, 1-29 to 1-31 contain sound effects. Pre-recordings made on November 20, December 10, 20, 1948 and January 17, February 2, 23, March 3, 1949; score recorded April 4, 5, June 7, 14, 15 and 16, 1949; at M-G-M Studios Scoring Stage, Culver City, California. Published by EMI Robbins Catalog Inc. (ASCAP) © 1949 Turner Entertainment Co., A Warner Bros. Entertainment Company. Five selections from the soundtrack of Madame Bovary were released on a 2-disc 78 rpm album by MGM Records (MGM-43) in 1949. All of them can be found in this box set: “Prelude” and “Romance” (track 11-18), “Torment” and “Passepied” (track 11-19) and the “Madame Bovary Waltz” (track 1-10). In 1957, MGM Records reissued these same selections on a 12″ LP (E3507ST) combined with soundtrack cues from Ivanhoe and Plymouth Adventure (which had initially been issued together on a 10″ LP in 1952, MGM Records E179). Polydor reissued this LP in the U.K. in 1974 (MGM Select 2353 095). THE RED DANUBE. Total Time: 13:54. Pre-recordings made March 11 and April 11, 1949; score recorded June 6, August 18 and 29, 1949; at M-G-M Studios Scoring Stage, Culver City, California. Published by EMI Robbins Catalog Inc. (ASCAP) © 1949 Turner Entertainment Co., A Warner Bros. Entertainment Company. THE MINIVER STORY. Total Time: 9:19. Music recorded August 29 and September 5, 1950, at M-G-M Studios Scoring Stage, Culver City, California. Published by EMI Robbins Catalog Inc. (ASCAP). Track 2-12 Published by Irving Berlin Music Company (ASCAP) © 1950 Turner Entertainment Co., A Warner Bros. Entertainment Company. THE ASPHALT JUNGLE. Total Time: 9:00. Score recorded February, 1, 1950; source music recorded February 2 and March 6, 1950; at M-G-M Studios Scoring Stage, Culver City, California. Published by EMI Robbins Catalog Inc. (ASCAP) © 1950 Turner Entertainment Co., A Warner Bros. Entertainment Company. EAST SIDE, WEST SIDE. Total Time: 3:43. Score recorded October 18 and November 1, 1949, at M-G-M Studios Scoring Stage, Culver City, California. Published by EMI Robbins Catalog Inc. (ASCAP) © 1949 Turner Entertainment Co., A Warner Bros. Entertainment Company. THE LIGHT TOUCH. Total Time: 41:29. Score recorded August 11 and 13 1951, at M-G-M Studios Scoring Stage, Culver City, California. Published by EMI Robbins Catalog Inc. (ASCAP) © 1952 Turner Entertainment Co., A Warner Bros. Entertainment Company. QUO VADIS. Total Time: 151:20. Tracks 3-3 to 3-5, 3-7, 3-11 to 3-14, 3-17 to 3-26, 3-29 to 3-31, 3-33 contain sound effects. U.S. pre-recordings made on April 18, 27 and May 3, 1950. Score recorded during April 1951 at Elstree Way Studios (M-G-M Stage 7), Borehamwood, England; U.S. score revisions recorded August 15, 16 and 23, 1951. U.S. recordings made at M-G-M Studios scoring stage, Culver City, California. Published by EMI Robbins Catalog Inc. (ASCAP) © 1951 Turner Entertainment Co., A Warner Bros. Entertainment Company. Tracks 4-1 to 4-12 originally released as MGM Records E103. THE STORY OF THREE LOVE. Total Time: 77:56. Music recorded February 21, 29, June 19, September 11, October 2, 3 and 4, 1952 at M-G-M Studios scoring stage, Culver City, California. 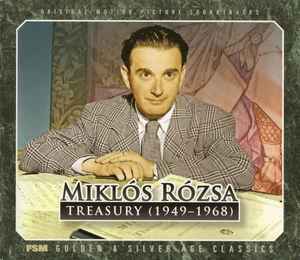 Miklós Rózsa compositions published by EMI Robbins Catalog Inc. (ASCAP). "Rhapsody On A Theme Of Paganini" published by Boosey & Hawkes/Rachmaninov (ASCAP). "Dark Is The Night" published by EMI Feist Catalog Inc. (ASCAP). "Over The Waves" published by EMI Robbins Catalog Inc. (ASCAP). "Boccaccio March" published by EMI Robbins Catalog Inc. (ASCAP) © 1953 Turner Entertainment Co., A Warner Bros. Entertainment Company. YOUNG BESS. Total Time: 77:08. Music recorded September 30, 1952, January 21, March 2 and 4, 1953 at M-G-M Studios scoring stage, Culver City, California. Published by EMI Robbins Catalog Inc. (ASCAP) © 1953 Turner Entertainment Co., A Warner Bros. Entertainment Company. ALL THE BROTHERS WERE VALIANT. Total Time: 78:13. Music recorded January 26, 29, May 26, 27, 28, August 14 and 18, 1953 at M-G-M Studios scoring stage, Culver City, California. Published by EMI Robbins Catalog Inc. (ASCAP) © 1953 Turner Entertainment Co., A Warner Bros. Entertainment Company. KNIGHTS OF THE ROUND TABLE. Total Time: 84:32. Tracks 8-1 to 8-27 recorded at Elstree Way Studios, Borehamwood, England; dates unknown. Track 13-21 recorded October 13, 16, 30, November 18, 19, 23, 24, 27, December 1 and 23, 1953, at M-G-M Studios scoring stage, Culver City, California. Published by EMI Robbins Catalog Inc. (ASCAP) © 1953 Turner Entertainment Co., A Warner Bros. Entertainment Company. Selections from this recording were previously released on Varèse Sarabande STV 81128. CREST OF THE WAVE. Total Time: 20:04. Tracks 9-1 to 9-11 recorded February 15, 1954 at M-G-M Studios scoring stage, Culver City, California. Track 9-46 recorded at Elstree Way Studios, Borehamwood, England; dates unknown. Published by EMI Robbins Catalog Inc. (ASCAP) © 1954 Turner Entertainment Co., A Warner Bros. Entertainment Company. BEAU BRUMMELL. Total Time: 56:06. Tracks 9-12 to 9-14 recorded June 16, July 14 and August 25, 1954 at M-G-M Studios scoring stage, Culver City, California. Miklós Rózsa Compositions Published by EMI Robbins Catalog Inc. (ASCAP). Richard Addinsell Compositions Published by G. Schirmer Inc. (ASCAP) © 1954 Turner Entertainment Co., A Warner Bros. Entertainment Company. SOMETHING OF VALUE. Total Time: 49:26. Music recorded December 21, 26, 27, 1956 and January 28, 1957 at M-G-M Studios scoring stage, Culver City, California. Published by EMI Robbins Catalog Inc. (ASCAP) © 1957 Turner Entertainment Co., A Warner Bros. Entertainment Company. CRISIS. Total Time: 28:59. Music recorded February 2, 7, March 21, 24, 27, 29 and April 27, 1950 at M-G-M Studios scoring stage, Culver City, California. Published by EMI Robbins Catalog Inc. (ASCAP) © 1950 Turner Entertainment Co., A Warner Bros. Entertainment Company. TIP ON A DEAD JOCKEY. Total Time: 41:54. Music recorded May 14, June 17 and 26, 1957 at M-G-M Studios scoring stage, Culver City, California. Published by EMI Robbins Catalog Inc. (ASCAP) © 1957 Turner Entertainment Co., A Warner Bros. Entertainment Company. ROGUE'S MARCH. Total Time: 0:43. Track 11-30 adapted from "General's Deafeat" from COMMAND DECISION. Music recorded August 18, 1952 at M-G-M Studios scoring stage, Culver City, California. Published by EMI Robbins Catalog Inc. (ASCAP) © 1953 Turner Entertainment Co., A Warner Bros. Entertainment Company. DESPERATE SEARCH. Total Time: 4:59. Tracks 11-31 to 11-35 adapted from "Dix's Demise" from THE ASPHALT JUNGLE. Music recorded September 19, 22 and 23, 1952 at M-G-M Studios scoring stage, Culver City, California. Published by EMI Robbins Catalog Inc. (ASCAP) © 1952 Turner Entertainment Co., A Warner Bros. Entertainment Company. CODE TWO. Total Time: 3:19. Track 11-36 adapted from "Dix's Demise" from THE ASPHALT JUNGLE and "Left Alone" from CASS TIMBERLANE. Music recorded December 15, 1952 at M-G-M Studios scoring stage, Culver City, California. Published by EMI Robbins Catalog Inc. (ASCAP) © 1952 Turner Entertainment Co., A Warner Bros. Entertainment Company. KING OF KINGS. Total Time: 81:30. Tracks 12-1 to 12-16 originally released on LP as MGM 1E2/S1E2. Tracks 12-1 to 12-16, 12-34, 13-27 recorded June 6 and 7, 1961, in Rome, Italy. Tracks 12-17 to 12-33 recorded February 16, 17, 20, March 15, 16, 17, 21 and May 3, 1961, at M-G-M Studios scoring stage, Culver City, California. Published by EMI Robbins Catalog Inc. (ASCAP) © 1961 Turner Entertainment Co., A Warner Bros. Entertainment Company. EL CID. Total Time: 45:07. Tracks 13-1 to 13-12 previously released on LP as MGM E/SE 3977 ST. Music recorded October 1961 in Munich, Germany. Published by EMI Robbins Catalog Inc. (ASCAP) © 1961 Samuel Bronston Productions Inc. ©&℗ 2009 Samuel Bronston Productions Inc.
IVANHOE. Total Time: 11:59. Music recorded June 25, December 6, 7, 8, 10, 1951 and January 16 and 21, 1952, at M-G-M Studios scoring stage, Culver City, California. Published by EMI Robbins Catalog Inc. (ASCAP) © 1952 Turner Entertainment Co., A Warner Bros. Entertainment Company. LUST FOR LIFE. Total Time: 8:13. Music recorded March 15, April 12, May 2, 3, 15 and June 1, 1956, at M-G-M Studios scoring stage, Culver City, California. Published by EMI Robbins Catalog Inc. (ASCAP) © 1956 Turner Entertainment Co., A Warner Bros. Entertainment Company. THE V.I.P.s. Total Time: 40:55. Originally Released on LP as MGM E/SE-4152. Music recorded in Rome, Italy; dates and venues unknown. Published by EMI Robbins Catalog Inc. (ASCAP) © 1963 Turner Entertainment Co., A Warner Bros. Entertainment Company. GREAT MOVIE THEMES COMPOSED BY MIKLOS ROSZA. Total Time: 33:29. Originally released on LP as MGM E/SE-4112. Music recorded in Rome, Italy; dates and venues unknown. Track 14-13 published by CAM Cine TV Music Inc. and EMI Robbins Catalog Inc. (ASCAP). Track 14-15 published by WB Music Corp. (ASCAP). Tracks 14-14 and 14-18 published by Chappell & Co. Inc. (ASCAP). Tracks 14-16, 14-17, 14-19 and 14-20 Published by EMI Robbins Catalog Inc. (ASCAP) © 1963 Turner Entertainment Co., A Warner Bros. Entertainment Company. THE POWER. Total Time: 73:34. Music recorded May 10, September 7, 8 and November 7, 1967, at M-G-M Studios scoring stage, Culver City, California. Published by EMI Feist Catalog Inc. (ASCAP) © 1968 Turner Entertainment Co., A Warner Bros. Entertainment Company. ©&℗ 2009 Turner Entertainment Co., A Warner Bros. Entertainment Company. Package Design © 2009 Turner Entertainment Co., A Warner Bros. Entertainment Company.